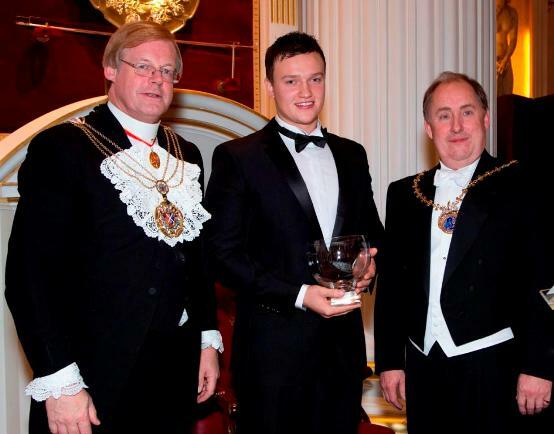 The finest young talent in the glass industry was celebrated as the Worshipful Company of Glass Sellers and Looking Glass Makers of London, supported by The Glass Academy @ the British Glass Manufacturers’ Confederation, announced the winners of their annual Best Apprentice of the Year Awards. Presented by Alderman Sir David Wootton, last year’s Lord Mayor of the City of London, at the Glass Sellers Mansion House banquet, the awards recognise those apprentices who have demonstrated exceptional ability and commitment to their training and skills development, as well as the significant impact apprentices make to their employer’s business development and growth. Nathan Herring from Saint-Gobain Glass, Eggborough, and Reuben Allonby from Cumbria Crystal were recognised as Highly Commended runners-up by the judging panel, with Mike Crotty from Quinn Glass in Elton, Chester, named Best Apprentice of the Year 2013-2014. The three finalists were invited to the event along with representatives from their respective companies and all three received bespoke glass trophies. Nathan was nominated by Saint-Gobain due to the dedication he has shown throughout his apprenticeship programme. A great example that demonstrated Nathan’s initiative, proactive approach and conscientiousness was when he prevented a fire on the laminating line which could have caused severe damage to the manufacturing line. “The glass industry in the UK needs world-class skills to compete on a global scale and to manage the challenges of the future. “These apprentices all excelled in their chosen spheres and are an inspiration to other young people considering a career in our sector. “We are committed to ensuring apprentices in our industry have real, permanent jobs to go into and to enabling employers to really take ownership of the apprenticeship programme so they have the skills the company needs to move forward. “As an example, 14 new engineering apprentices started work last month in glass factories across the UK as part of the industry’s drive to maintain first class skills.